This is one of my very favorite desserts! This recipe is sort of like a cross between a chocolate chip cookie and a pecan pie. And it’s so easy to make! 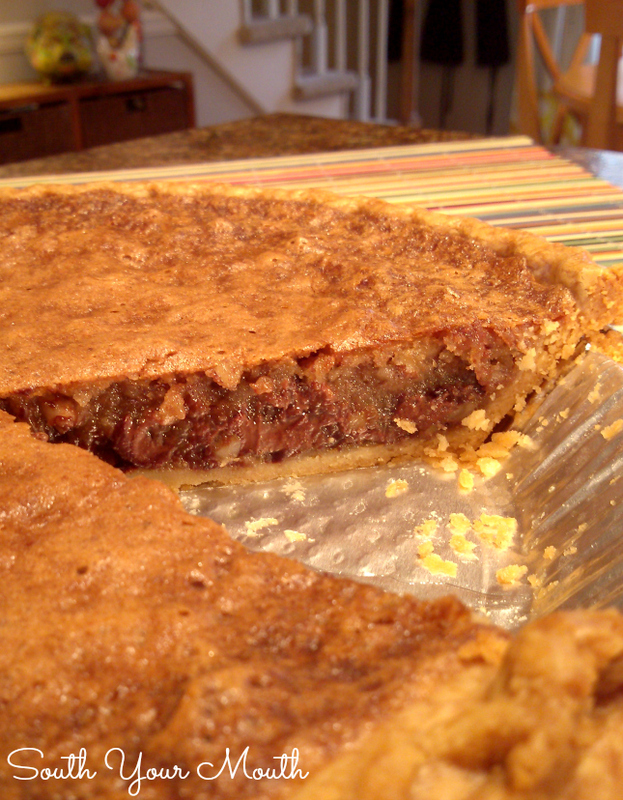 When it’s warm, it’s more like a chocolaty pecan pie then when it sets up it’s more like a cookie. It’s kind of like two desserts in one! And I like any pie recipe that yields two pies. That’s a win-win in my book any day. Serve this warm with a scoop of vanilla ice cream or at room temperature with a big ol’ glass of milk! I know you were expecting one of my stories or to hear about some of our shenanigans but I got nothing. I started to tell you about the loaf of bread that was mysteriously smashed and left for dead in my cabinet. Presumably by someone trying to reach the Doritos hidden in the back of the top shelf but it sounded very paranoid. And kooky. I've got the culprits narrowed down to Flossy or Husband. And I got my eye on you two. You just watch out. Ima be all over you like a spider monkey if I catch you smashing my bread again. Cream together eggs, sugars, corn syrup, butter, vanilla and salt with an electric mixer until smooth. Add flour and continue mixing until well combined. Stir in chocolate chips and nuts. Pour batter evenly into pie shells and bake at 325 degrees for 45 minutes or until a knife inserted halfway between edge and center comes out clean (it’s OK if the center is still slightly jiggly). *Use the ready-made frozen ones or my recipe for Flaky Butter Pie Pastry. Boy does that ever sound good! 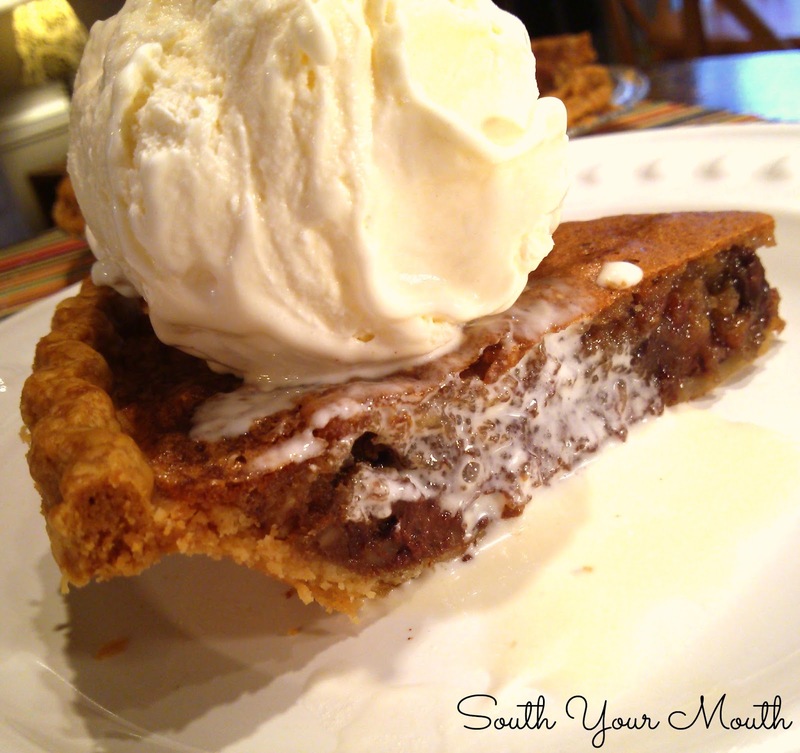 How can it get any better -- a chocolate chip cookie with pecan pie. Sort of a sophisticated cookie pie. Thank you for the recipe I'll be sure to pin it and then do it.